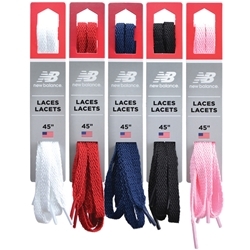 You won't find a better, simpler lace than New Balance's tried and true flat laces. Available in any color and size you could want, these laces will keep your shoes on your feet no matter where you end up! Quantity: Size 27" 36" 40" 45" 54" 63"
Quantity: Size 27" 36" 40" 45" 54"
Quantity: Size 27" 36" 40" 45"
Quantity: Size 27" 36" 45" 54" 63"